My first wooden dollhouse(above) came about when my dad was working on a random project around the house (I think it might have been putting shelving in a closet). I remember remarking to him that he was very good at working with wood and that maybe he might be able to make a dollhouse. I doubt making a dollhouse was in the plans for that weekend, but my dad indulged me and created the dollhouse above. He asked me how big to make it, and I just brought out a few random dolls and we figured out a rough sketch of what it would be like. It could be simple, I told him, and I wasn't really expecting much. It was his suggestion to include stairs, and I remember helping him glue the steps on truly amazed at how he figured out how to make them. This dollhouse had a revolving number of visitors and furniture, and was constantly be remodeled with good old Elmer's glue. By the time I begged my parents for a kit for a fancy Victorian dollhouse for Christmas (which I have many fond memories of putting together with my father), this first dollhouse was majorly trashed. It sat up in my parents' attic for years until we got it down a few weeks ago. It needed a major overhaul. Yet despite its appearance, when my oldest saw me pull this dollhouse from the trunk of the car a few weeks ago she was so excited. She could see the potential immediately. It was a DOLLHOUSE after all. A real dollhouse in her own garage. It's poor condition didn't seem to phase her. I knew right away that this project was going to have to happen sooner rather than later. After a few weekends of lots of scraping and painting, I'm happy to say that my first dollhouse is now open for play (picture below). I'm very happy with how it turned out. I think it will provide years of entertainment for them. As a Valentine's day gift for them I gave them some artwork for the house. My oldest picked out all of the papers for the back walls and the colors of the flooring. She also helped me glue on the papers for the 'rainbow staircase' she wanted. I think it's my favorite part of the whole house. The flooring just sits in the dollhouse (I didn't glue it down) because she insisted that the flooring should be interchangeable. She already wants to go back to the hardware store to pick out some more carpet that she can switch out. (I used about 3 feet of carpet runner--about $6 and nice because it is thin and doesn't seem to fray). But the decorating potential of this dollhouse doesn't end there. 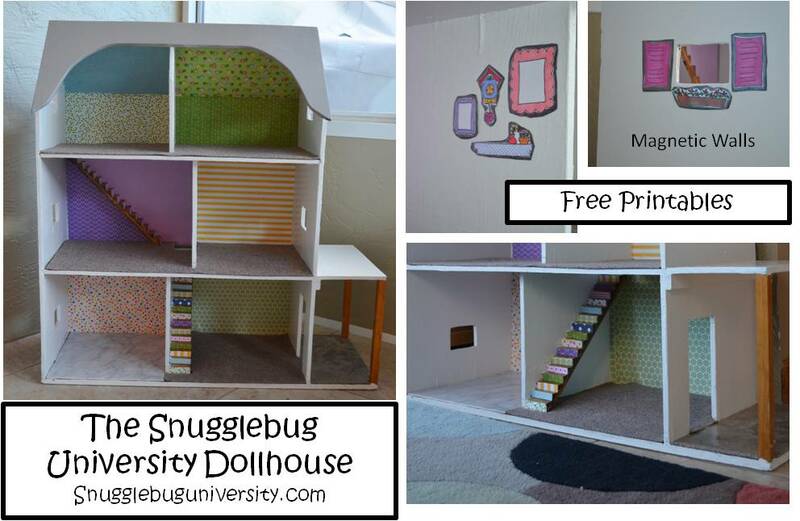 When I was painting this dollhouse, I used a secret type of paint which at first I think almost brought my little Snugglebug to tears. Magnetic Primer. It also happens to be black. So when my daughter ran into the garage to see the progress I made while she napped, she was horrified. I painted her beloved dollhouse BLACK! I promised her that it would be worth it, and now she loves it's magnetic properties. Magnetic primer isn't cheap (about $25 for a small can--I used about 1/3 of a can, but I didn't cover the entire outside, just select areas). All of the rest of the paint I used I already had on hand though, so I didn't mind splurging a little bit to make the house magnetic. I printed out pictures of our family, along with art work created by members of our family so the kids could decorate and redecorate the dollhouse to her heart's content. I laminated them and attached them to a magnetic sheet, which I also happened to have on hand. My oldest squealed when she saw them..."But these are the pictures in our house!!!" 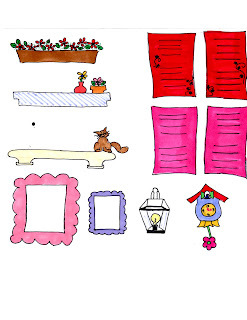 I also drew some shutters and other miscellaneous things for decorating which you are also free to use for your own personal use. 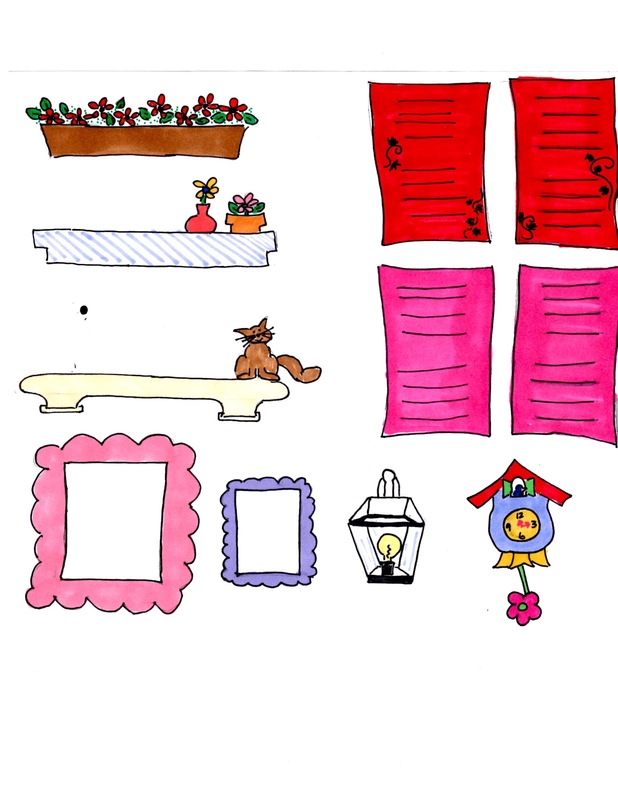 The picture frames are blank, but since I laminated them they can be decorated with dry erase markers. As the girls get older I hope that they will add their own artwork. The magnetic properties of the house will also make it easier to attach curtains, shelves, and other things to the walls of the house, hopefully eliminating the globs of Elmer's glue that I was so fond of as a child. All and all, I'm so excited for the kids to have this empty dollhouse with plenty of decorating potential. Over time we might add furniture a piece at a time, but I want my kids to try to make their own. I want them to see the potential in a box as a bed, or a bottle cap as a lamp. Hopefully my girls will like it as much as I did. Making a dollhouse for my two daughters this year (2 & 4) and came across this older post. I had the idea to make magnetic walls and wanted to see if anyone else had attempted it. Thanks for posting the details! I was debating the extra step but hearing how much your daughter enjoyed that detail, I am sold!